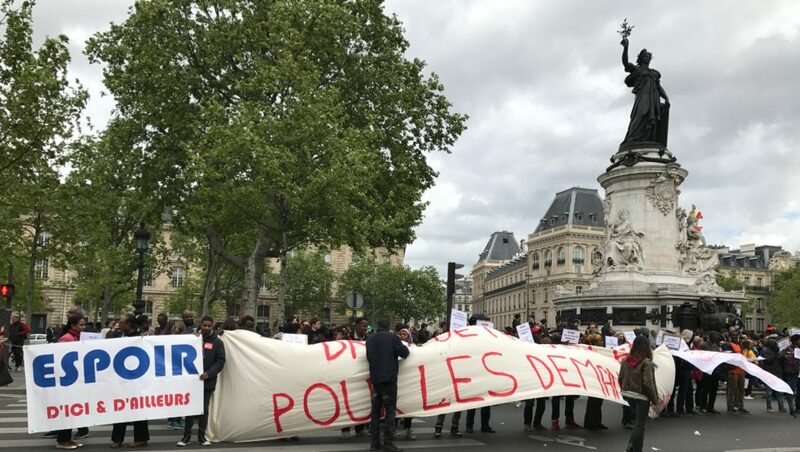 MAY 1 IS LABOR DAY in almost all of Europe (the Netherlands and Switzerland are the exceptions), and in France it’s a day for political demonstrations led by the unions or the political parties — or both. I never want to miss a party, so I went out to Place de la République this afternoon to see the sendoff of the third demonstration of the day. 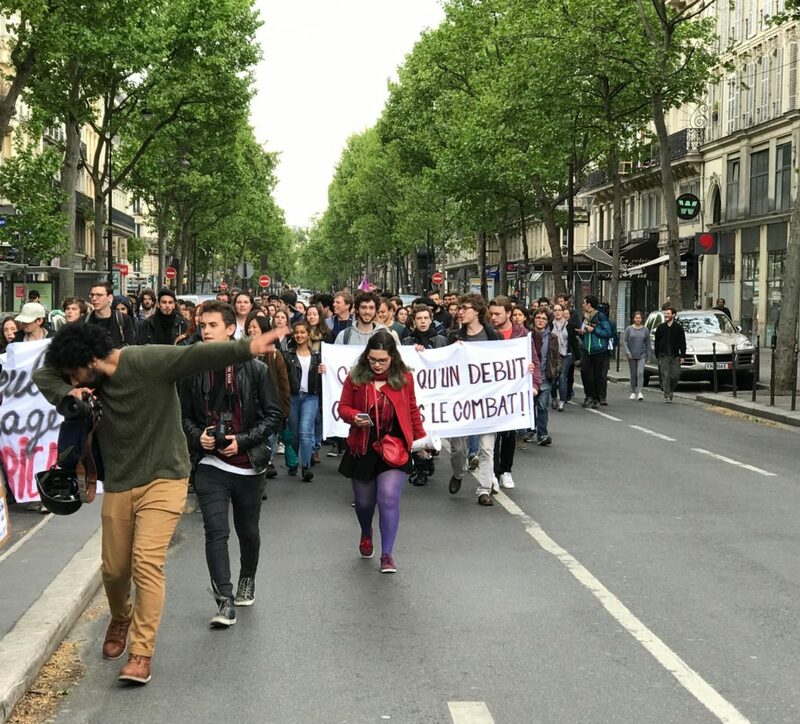 Anti-Le Pen demonstrators. The sign says “Hope, here and elsewhere.” The statue represents Marianne, the personification of the French Republic. It started at République, the eight-acre square that sits at the meeting point of three arrondissements, about three-quarters of a mile northeast of the Pompidou Museum and not far from the Marais. At 3pm it was full and the crowd was still streaming in. By my count there are nine streets, large and small, leading into the place, and people were streaming in through all of them at a steady pace. The police presence was substantial, but not nearly so large as Paris can turn out if it must. Multiple police vehicles blocked every approach road, the objective obviously being to block any more truck attacks, and the square itself had a line of riot police facing it at every intersection. The riot police look like Darth Vader when they are in full riot gear, and these were, but I saw several of them chatting merrily with the spectators. They stood four or five feet apart so there was free passage in and out for pedestrians. Bicyclists came and went through the police line, and from my vantage point I saw at least a half-dozen couples with babies, either in strollers or their arms. Several people stopped to watch as they were walking their dogs. French pop and light rock came from a set of stadium-volume speakers set atop a truck, which led the march out of the square. The day wasn’t all puppies and sunshine, although there was some of both. Shortly after the main body of demonstrators set off, a group of masked attackers (one newspaper called them perturbateurs, which I thought summed it up nicely) threw stones and Molotov cocktails at the police, hitting mainly buildings along the street, but injuring six police officers. As of Tuesday morning, four people had been arrested. All is not politics on May 1. 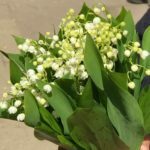 One of the great and favorite traditions is the sale of muguet, or lily of the valley. The tradition dates from the sixteenth century, when King Charles IX offered them to his subjects as tokens of good luck. 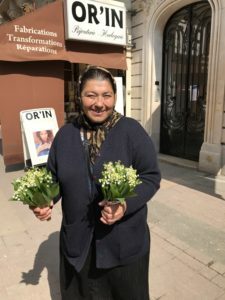 In the days leading up to May 1, the aromatic, bell-shaped flowers are sold on every street corner, mostly by “the traveling people,” or gens de voyage, the Roma, from Eastern Europe, primarily Romania. They have established a strong foothold in the market. Muguet are pretty and have a nice smell, although they are poisonous. They grow freely in the forests, and there are people (other than the Roma) who harvest them there and package them into bunches for sale. Tomorrow, unfortunately, the vendors will be gone, but someone else will be in front of the grocery store offering to sell something or ask you to take a survey or give blood. A separate group nearby. The sign promises their march is just the beginning and the fight will continue, but I couldn’t see what they were fighting. One of many group wranglers. 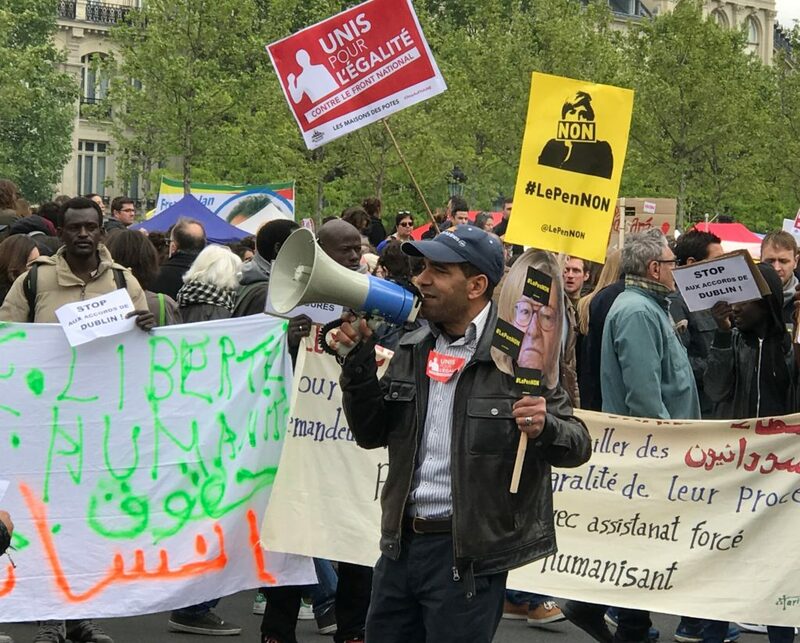 His poster says “Le Pen No,” but his group’s main concern seemed to be deportations.